IT ALL STARTED WHEN Kymberly Andren, owner of Motor City Vintage Rentals, bought her first 1949 Packard in 2011. She dreamed of bringing it back to the Packard Plant on East Grand Boulevard where it was built. The historic Albert Kahn-designed building was abandoned and in a state of disrepair. It was in foreclosure, and there was talk of tearing it down. But in 2013, new owners took over and began renovations in 2017. Shortly after, Andren pitched them a crazy idea: she wanted to do a bridal photoshoot there with her second, newly purchased 1940 Packard. 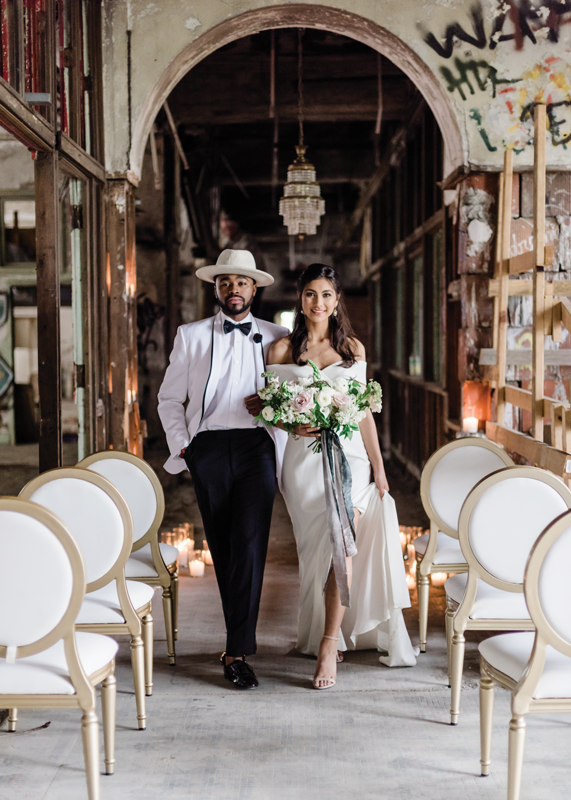 She wanted to use the backdrop of the Packard Plant to showcase a Detroit couple honoring not just their love for each other, but also their love of Detroit. 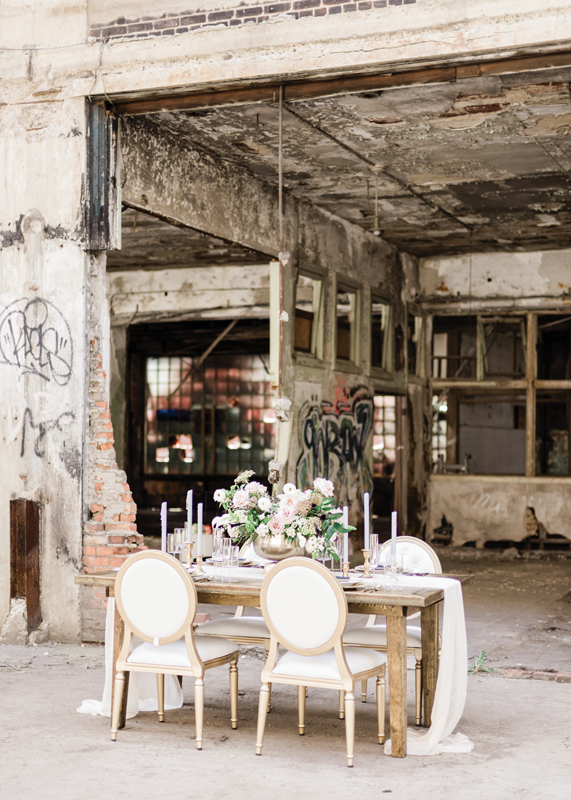 Her vision was a juxtaposition of sorts: a glamorous wedding in an industrial, rough-around-the-edges venue; a celebration of Detroit’s rich past, present, and bright future. How the photoshoot came together was equally important to Andren’s vision. 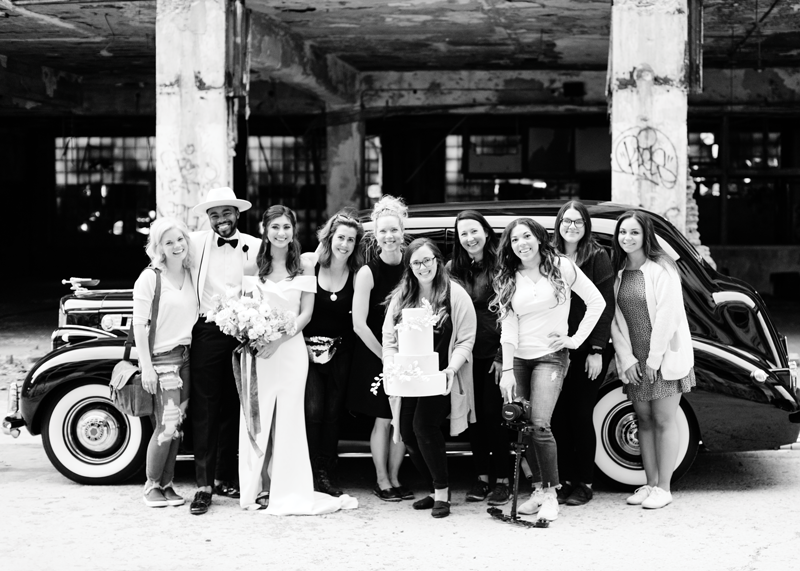 She wanted to collaborate with talented, Detroit-based female entrepreneurs — a wedding planner, florist, photographer, and calligrapher — to bring her idea to life. Here are the creative minds behind the photographs. 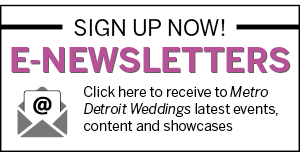 Andren has been a business owner since 2011, when she started her company, Motor City Vintage Rentals. 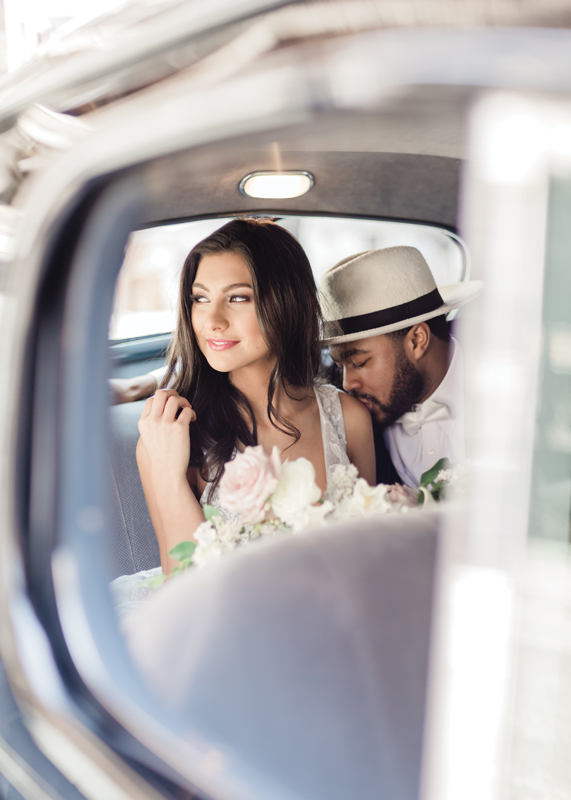 She bought a Packard for her own wedding and, shortly after, decided to rent it out to others. Since the transportation industry is male dominated, Andren didn’t want people to know she was a woman. She thought she wouldn’t be taken seriously. But her husband encouraged her to put herself at the forefront of her brand. That genuine, “be yourself” strategy has worked for Andren: the couples she works with become more than just clients. After all, she’s there throughout the whole wedding-planning process. Photographer Samantha Leigh also had a goal for 2018: to do more creative projects, instead of just commission-based work. She posted her intention on Instagram, and Andren responded immediately. That’s what Leigh loves about photography — finding ways to reveal the originality of her subjects. She’s been shooting weddings since college. She loves getting to know couples and bringing out their personalities through her photographs. Another, albeit quite different, challenge of her job is being a business owner. It was empowering for her to work with other talented women on the Packard Plant shoot because of the support they gave each other. 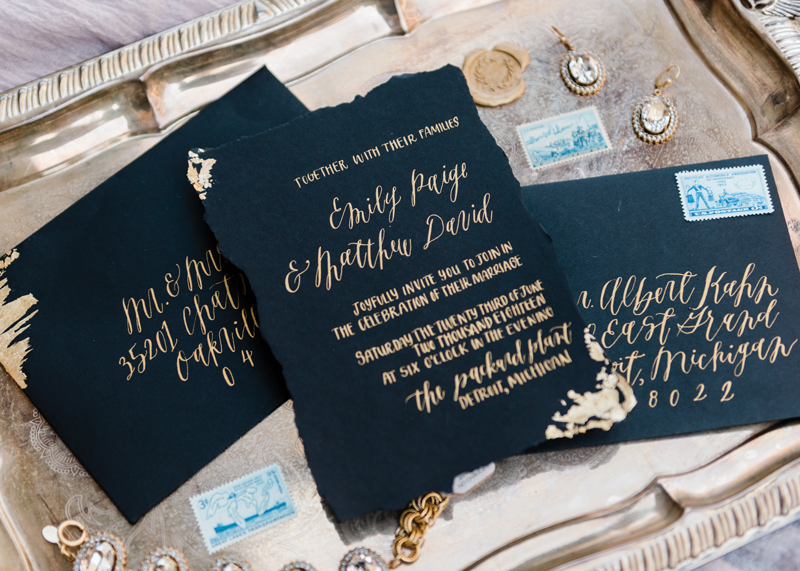 The invitation suites are the first indication of what a wedding might be like, says calligrapher Patricia Heffner, so she always foreshadows the look and feel of an event with her custom designs. Working on the Packard Plant project was not unlike doing research for her real couples — the only difference was that in this case, her research was about the history of the plant. Heffner’s enthusiasm for each project shows in her work — she never repeats the same signage or invitation twice, even though this is a side business. 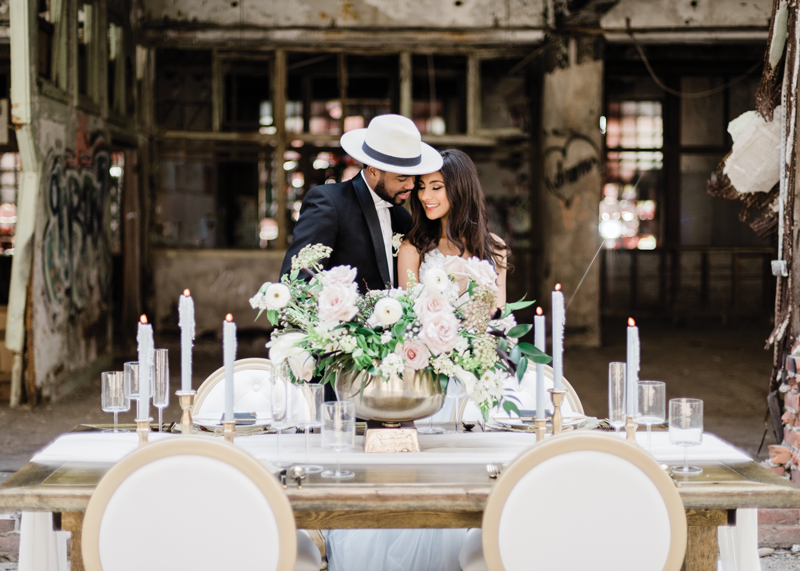 When wedding planner Meagan McPhail is helping couples source ideas, she creates a Pinterest board for them made entirely with non-wedding images. “It stimulates your creativity to find inspiration from everyday objects, like a glass of rosé, or a cozy fall sweater,” she says. 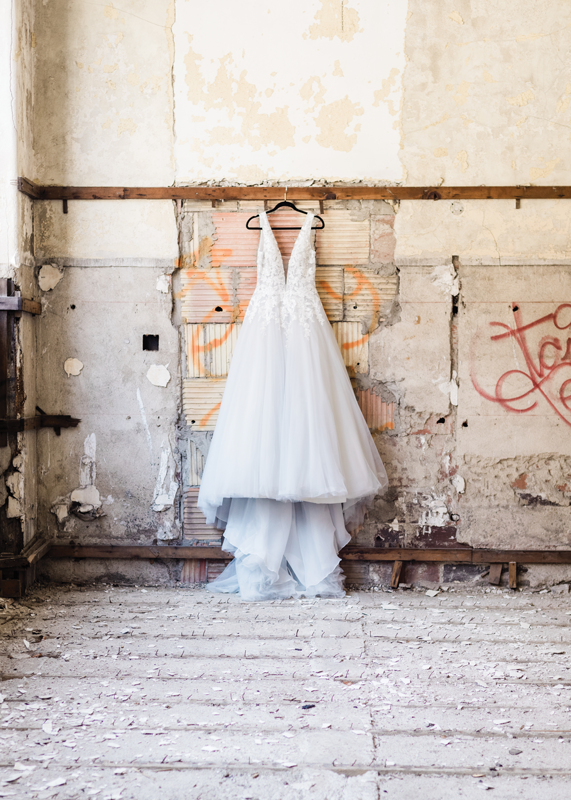 She’s always on the lookout for new concepts — she’s been wedding planning since she was in high school — so McPhail loved that she was able to incorporate edgier elements into the Packard Plant shoot that perhaps real brides aren’t ready for, like the dusty blue dress the model is wearing in lieu of a traditional white gown. Wedding planning is in McPhail’s blood. It’s what she’s wanted to do since she was 12 years old — there was no other occupation in consideration. It started as an after-school hobby, organizing weddings in local churches. She made it her professional career after working in the luxury hotel business for a few years. But the risk has been more than worth it — being able to work with wonderful brides and incredible entrepreneurs is a great pay off. She’s now in her fourth season of wedding planning, does about 20 weddings per year, and has no intention of slowing down. 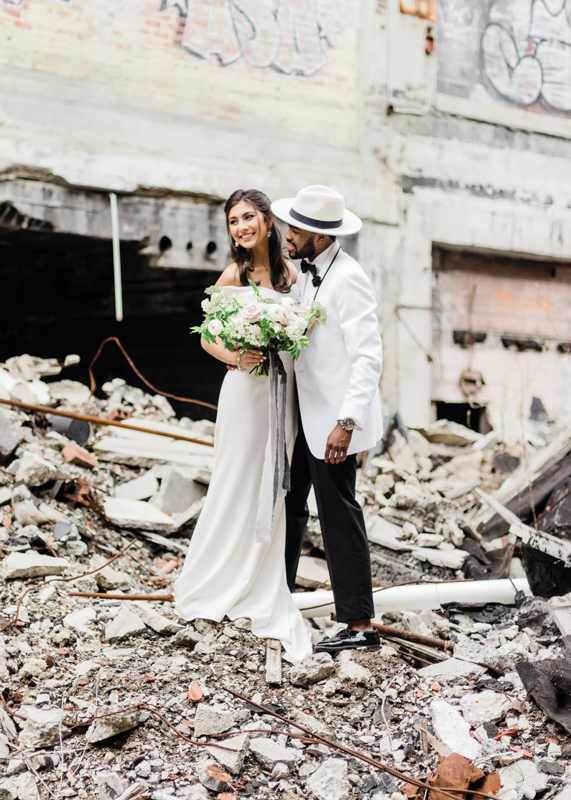 “You can dream all day long by yourself, but it’s when you work with other people who are also creative that you can bring those dreams to life,” says florist Natalia Januszewski of her experience on the Packard Plant shoot. She loved being able to meet other wedding vendors who share a love for a similar aesthetic. At the former factory, Januszewski wanted the flowers to be classic and organic — nothing too overpowering — because the background was the statement. She also chose flowers based upon their shape, using roses and calla lilies to mimic the modern, architectural feel of the urban surroundings. For all of her talent, Januszewski is a self-taught florist. 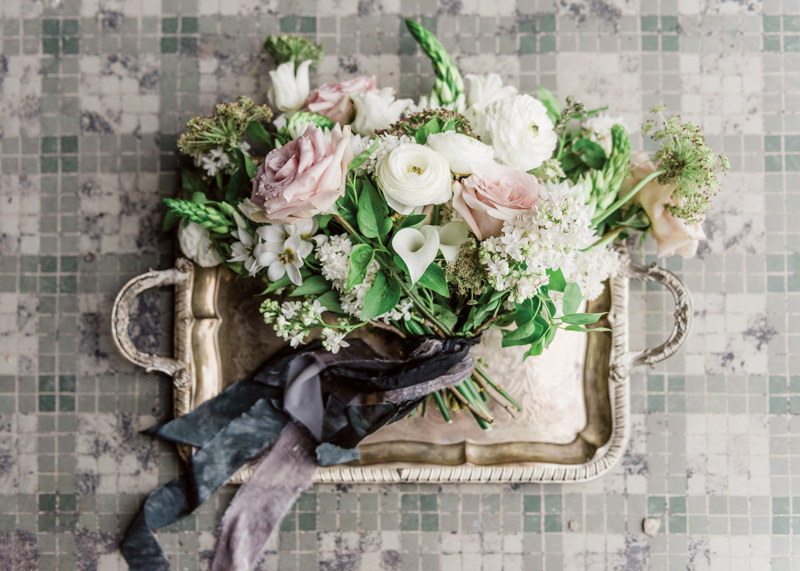 She first dabbled in wedding planning, but soon realized she wanted to create things with her hands. To bring their vision to life, the ladies behind the shoot turned to a dream team of vendors, including: Andrea Nichols (makeup), The Wedding Shoppe (bride’s attire), Valente’s Men’s Formalwear (groom’s attire), Jennifer Schropp (hair stylist), Firefly Premier (table and chairs), Event Theory (table settings), Sweet Heather Anne (cake and desserts), Fabulous Events (linens), DuMouchelles (jewelry), Two James Spirits (beverages) and The Ten Detroit (nails).